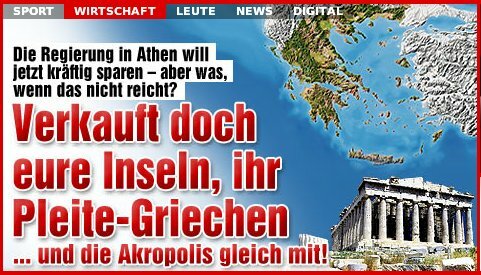 Priding itself on openly saying what “the man on the street” thinks, the German tabloid Bild suggested a seemingly simple strategy to deal with Greece’s debt problems: rather than relying on other countries’ financial assistance, Greece should instead sell some of its islands and, if necessary, the Acropolis as well. Perhaps unsurprisingly, European finance ministers ignored this recommendation and instead set up an EU bailout fund of €800 billion. Although the IMF, the European Commission, and others demanded an increase of the fund upward of €1 trillion, German finance minister Wolfgang Schäuble opposed further expansion, deeming it unacceptable to the German public. Indeed, several snap polls reported that about two thirds of the German citizens oppose such bailouts for over-indebted Euro countries. Although public opinion is widely regarded as a major constraint on governments’ actions in the ongoing debate over the bailouts, scholars know very little about the factors that underlie voters’ attitudes towards such international transfers. In particular, it is unclear whether voters’ opinions reflect their assessments of how the bailouts would affect their own well-being, that of their country, or perhaps that of their fellow Europeans. In a new paper, Jens Hainmueller, Yotam Margalit, and I begin addressing this question. We conducted two large-scale surveys in Germany, the country shouldering the largest share of the EU’s financial rescue fund. Our results show that while the economic features of the bailout package itself strongly affect voters’ willingness to support the bailouts, individuals’ own economic standing has limited explanatory power in accounting for their position on the issue. In contrast, social dispositions such as altruism and cosmopolitanism are robustly associated with support for the bailouts. This suggests that the current divide in public opinion towards the bailouts is generally not along distributive lines between domestic winners and losers. Instead, the divide is better understood as a foreign policy issue that pits economic nationalist sentiments versus greater cosmopolitan affinity and other-regarding preferences. This entry was posted in European Union, International, Research and tagged Finance, Political economy, Redistribution by Michael M. Bechtel. Bookmark the permalink.